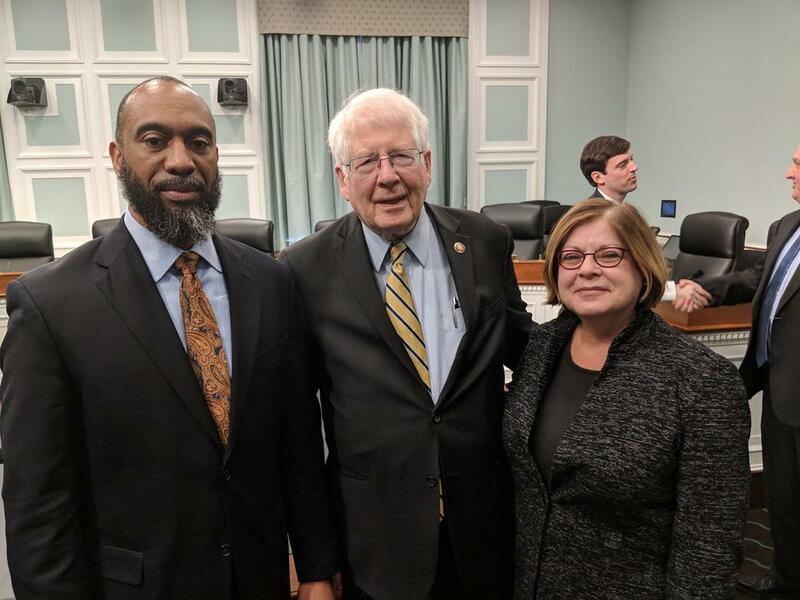 WASHINGTON (March 7, 2019) – This morning, Durham Housing Authority CEO Anthony Scott testified on behalf of the Council of Large Public Housing Authorities before the House Appropriations Subcommittee on Transportation, Housing and Urban Development, and Related Agencies during its hearing, “Stakeholder Perspectives: Affordable Housing Production.” Scott emphasized the critical need for reinvestment in the nation’s Public Housing and Section 8 Housing Choice Voucher programs, which are the foundation of the affordable housing market. 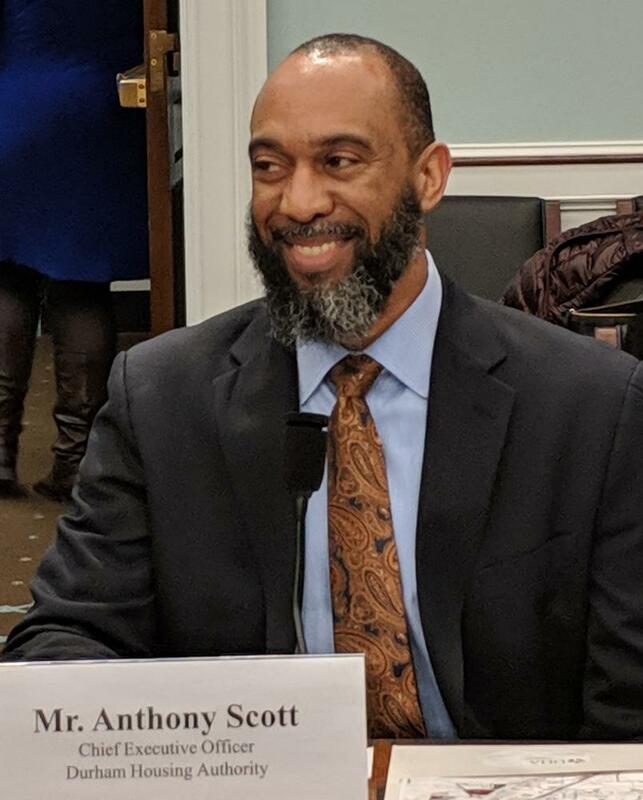 “As a nation, we are now at a critical stage for needing aggressive action to undertake affordable housing production and preservation,” testified Scott. In addition to calling for increased appropriations to the public housing capital and operating funds, Scott urged Congress to combat the affordable housing shortage by providing housing authorities greater flexibility to preserve and transform public housing through the Rental Assistance Demonstration Program, the Moving to Work program, and with selected and targeted flexibilities through a defined statutory process. Scott also recommended Congress eliminate the Faircloth Amendment, which prohibits the development of new public housing units; invest in broad place-based solutions such as the Choice Neighborhoods Initiative to address neighborhood and community development needs; encourage greater interdepartmental collaboration to facilitate cross-sector partnerships with housing; and distinguish public and affordable housing as an integral part of the national infrastructure. Along with Scott, representatives from the North Carolina Housing Finance Agency and National Housing Trust were invited to participate in the Appropriations Subcommittee hearing. The testimony is posted to the Committee website and the live-stream recording of the hearing can be viewed on the Committee's YouTube channel. Washington, DC – Members of the Campaign for Housing and Community Development Funding (CHCDF) hosted a national call with over 2,200 registrants yesterday, January 15, about the effects of the partial government shutdown on low-income people and communities and the affordable housing programs that serve them. Experts from multiple affordable housing organizations shared information on the shutdown’s impact on federal affordable housing and community development programs and emphasized that the longer the shutdown continues, the more negatively it will impact people with the lowest incomes – seniors, people with disabilities, and families with children. Panelists spoke about the shutdown’s effects on public housing, project-based rental assistance, housing vouchers, rural housing, and housing and services for seniors, people with disabilities, the homeless, and those at risk of homelessness. The panel encouraged listeners to contact their members of Congress and tell them to vote now—before residents in federally assisted housing experience rent hikes and evictions—to reopen the federal government and pass clean fiscal year 2019 spending bills. Listeners were also urged to encourage their members of Congress to sign onto a “dear colleague” letter led by Senator Mark Warner (D-VA) and Representative Marc Veasey (D-TX) to be sent to President Trump on the shutdown’s severe consequences for affordable housing. “As the budget stalemate continues, the impact on small towns and rural families grows more severe. Everyday Americans are losing out on billions of dollars’ worth of affordable housing, clean drinking water, and community facilities, like town halls, fire stations and hospitals,” said Housing Assistance Council CEO David Lipsetz. Check out NLIHC’s interactive map and a state-by-state breakdown of how the shutdown is impacting some HUD-assisted housing. About the Council of Large Public Housing Authorities (CLPHA): The Council of Large Public Housing Authorities is a national non-profit organization that works to preserve and improve public and affordable housing through advocacy, research, policy analysis and public education. A coalition of more than 70 national organizations tell the Administration & Congress that people with the lowest incomes will be hit hardest if the shutdown continues. Washington, DC - Members of the Campaign for Housing and Community Development Funding (CHCDF) sent a letter to congressional leaders today calling on them to protect low-income Americans by ending the government shutdown and passing full-year spending bills that provide strong funding for affordable housing and community development programs. Read the complete letter outlining the impact of the shutdown on specific affordable housing programs at: https://bit.ly/2RkB8Xd. About the Council of Large Public Housing Authorities: The Council of Large Public Housing Authorities is a national non-profit organization that works to preserve and improve public and affordable housing through advocacy, research, policy analysis and public education. “Though the storm itself is behind us, flooding and other destructive impacts of Hurricane Florence may take weeks or months to subside. As we consider the ongoing damage to Virginia and the Carolinas, our thoughts immediately turn to the most vulnerable segments of our population: low-income families and those who risk displacement from their homes. “The Council of Large Public Housing Authorities (CLPHA) and its entire membership supports providing assistance in any way we can to colleagues, partners, friends, and housing residents who have been affected by the devastation caused by Hurricane Florence. We will make available to the fullest extent any vital resources and support services we have at our disposal to help cities, PHAs, and residents recover from the storm. The Council of Large Public Housing Authorities is a national non-profit organization that works to preserve and improve public and affordable housing through advocacy, research, policy analysis and public education. CLPHA’s 70 members represent virtually every major metropolitan area in the country. Together they manage 40 percent of the nation’s public housing program; administer 26 percent of the Housing Choice Voucher program; and operate a wide array of other housing programs. Learn more at clpha.org and on Twitter @CLPHA. Washington, D.C. – Today, U.S. Department of Housing and Urban Development Secretary Ben Carson and Federal Housing Commissioner Brian Montgomery joined the Housing Authority of the City of Austin, its development partners Atlantic | Pacific Communities and Madhouse Development Services, and the Austin community to celebrate the groundbreaking of HACA’s most recent redevelopment of one of its public housing properties, Goodrich Place, which also represents the 100,000th public housing unit being converted through HUD’s Rental Assistance Demonstration program. Today we are celebrating an important milestone addressing the critical need for affordable housing by enabling housing authorities to convert public housing to more stable long-term Section 8 based contracts that will serve PHAs and residents for years to come. Through the Rental Assistance Demonstration program, agencies across the country can leverage private financing to complete capital improvements needed to preserve and improve the public housing stock, without giving up control of the asset. RAD engenders creative local partnerships, stimulates ongoing economic activity, and leads to improved housing quality for low-income seniors and families. As we celebrate the 100,000th RAD unit, it’s clear that we have proof of concept. To give PHAs greater certainty, HUD’s program should be permanent with unlimited opportunity for conversions to agencies meeting the requirements. Congratulations to HUD at this significant juncture, and to HACA and the residents of Goodrich Place who will soon have access to improved units in one of Austin’s highest opportunity neighborhoods. The Council of Large Public Housing Authorities (CLPHA)—with the support of the National Equity Fund (NEF), HAI Group, Reno & Cavanaugh, and CF Housing Group—organized the RAD Collaborative for interested Public Housing Authorities, their partners and residents using the Rental Assistance Demonstration to preserve and revitalize public housing properties. Our focus also includes extending RAD to multifamily housing at risk of being lost from the affordable inventory--including Rent Supp, RAP, Mod Rehab and Section 202 PRAC properties. Learn more at radcollaborative.org and on Twitter @SucceedwithRAD. Washington, DC – “The Council of Large Public Housing Authorities (CLPHA), representing more than 70 of the country’s largest and most innovative housing authorities, is calling on Congress to reject the Trump Administration’s FY18 budget, which proposes to slash $6.2 billion in funding to the Department of Housing and Urban Development (HUD), including $2 billion in cuts to public housing. If realized, the draconian cuts included in this budget would not only have severe and cumulative effects on public and affordable housing programs across the country, but it would also shred the safety net of other public assistance programs on which many low-income Americans rely. “The Trump Administration’s full FY18 budget proposal, released today, Tuesday, May 23, would devastate HUD programs that are currently helping over 1.2 million households that reside in public housing, including families, seniors, persons with disabilities, and close to 800,000 children. The budget targets America’s most vulnerable citizens with drastic cuts to Medicaid, the Supplemental Nutrition Assistance Program (SNAP), and Temporary Assistance for Needy Families (TANF), while also slashing disability benefits and student loan and education programs, thereby crippling essential support systems affecting many of the residents we serve in low-income housing. “The Administration’s dramatic HUD reductions come at a time when the federal government should actually be investing in public housing as part of the nation’s infrastructure, as such investment generates economic growth, creates jobs, bolsters productivity, and generates tax revenue for localities. “The budget proposes $628 million for the Public Housing Capital Fund compared to $1.942 billion in FY17; $3.9 billion for the Public Housing Operating Fund compared to $4.4 billion in FY17; $17.584 billion for Section 8 voucher renewals compared to $18.355 billion in FY17; and $1.55 billion for administrative fees compared to $1.65 billion in FY17. “Everyone should be alarmed by the magnitude of these proposed cuts -- the Public Housing Capital Fund alone sustains a cut of over 67 percent. The irony of this particular cut is that it not only undermines basic health and safety improvements, it also makes it virtually impossible to leverage private investment, which HUD claims is a major policy priority. “Another example is the proposed $771 million reduction to the Housing Choice Voucher program, which provides housing vouchers to needy families. These budget reductions, coupled with rising rents and inflation, will result in the loss of hundreds of thousands of vouchers and threaten currently-housed families with homelessness. CLPHA will host a call on May 21 at 2:00 PM ET to solicit member feedback on draft comments of the recently published notice on proposed changes to Section 3 and the related notice on proposed benchmarks. Comments are due on June 3. The NYU Furman Center and Abt Associates invite applications from interested cities or counties for the first-ever Local Housing Solutions Institute, “a five-day working retreat to help cities and counties refine and strengthen their housing strategies to better meet their affordability and other housing challenges.” The Institute is funded by a grant from the Arthur M. Blank Family Foundation. The Resident Opportunities and Self-Sufficiency (ROSS) – Service Coordinator Program helps public housing authorities, resident associations, non-profit organizations, and other HUD-funded entities receive funds for service coordinators, who work directly with residents to assess their needs and connect them with education, job training and placement programs, and/or computer and financial literacy services available in their community to promote self-sufficiency. The grant is paid out over a three-year period. Read “DCHA Awarded with a ROSS Grant” in the District of Columbia Housing Authority's e-newsletter. Read Westside Seattle's article “Lam Bow Apartments getting new 79 unit addition on Delridge Way SW,” featuring the Seattle Housing Authority. Read the San Diego Union-Tribune's article “Former homeless vets have new home in Normal Heights,” featuring the San Diego Housing Commission.